We encourage our clients to utilise their resources in the most efficient manner possible. 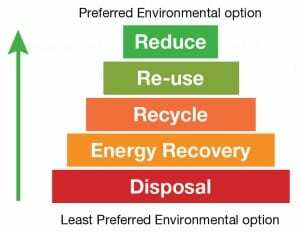 A thorough review of your operations will allow us to offer advise on waste minimisation and how to manage your waste streams cost-effectively and with maximum environmental efficiency. We will carry out a thorough review of your current waste management operations & processes. Reduction of waste being produced. Recovery and recycling of any waste removed from site. Any potential value / return there may be with your waste streams. We will also review the current waste documentation management system in place. We will present our proposal for streamlining this to suit your needs and reduce double handling of information. This will be encompassed in a complete waste management suite which should satisfy your accounts and regulatory requirements. If you feel you would benefit from any or all of the above proposals please feel free to contact us or fill in your details below and we will contact you.